Rodrigues, J. C. and Brito Neto, R. V. (2017). RNA Extraction from Wistar Rat Cochlea for qRT-PCR. Bio-protocol Bio101: e2621. DOI: 10.21769/BioProtoc.2621. Otology research has developed considerably in recent years and molecular analysis is crucial to identify metabolic pathways and therapeutic targets. However, the structure of the cochlea limits the amount of cell mass, and special care is required for RNA extraction. Studies applying this technique to the cochlea are scarce in the literature, and difficulties in this area exist. In the context, we describe a method for extracting RNA in Wistar rats for qRT-PCR analyses in order to clarify certain aspects and obtain good quality material. Understanding the molecular mechanisms involved in damage to hair cells is important to preserve hearing. qRT-PCR from mRNA is used in the study of metabolic pathways and possible therapeutic targets. Otological studies typically use small rodents, although the isolation of sensory cell samples with well-preserved RNA for transcriptional analysis is a significant challenge. Studies conducted with these animals have presented efficient methods for extracting RNA in the neonatal cochlea, however, adult cochlea presents limitations, due to the recovery of small amounts of mRNA. To evaluate the quality of the obtained RNA, ultraviolet absorbance and agarose gel electrophoresis can be performed. Herein, we describe a method to obtain mRNA from adult Wistar rats that can be subsequently used in qRT-PCR assays. Note: Eighteen male Wistar rats were used as subjects, weighing on average 50-200 g, housed under controlled conditions (temperature 22-23 °C and humidity 60 ± 5%), a 12 h light/dark cycle and food/water ad libitum. Animal handling and well-being conformed to current national Brazilian regulations regarding protection and care of animals used for scientific purposes. All procedures were approved by the Committee on Ethics of Animal Experimentation of Medical school of University of São Paulo and approved under protocol 146/15. To obtain an adequate amount of mRNA two rats, four cochleae are needed. Before each dissection, sterile surgical material should be cleaned with RNaseZap® to avoid RNases and placed at 4 °C for half an hour. Two animals (four temporal bones) are sufficient to obtain RNA, but four animals (eight temporal bones) should be used to obtain higher amounts. The animals are deeply anesthetized with 5% isoflurane (1 L/min O2 flow rate) and sacrificed by beheading. The temporal bones are quickly removed and placed in a tube with cold RNAlater®. This process must be performed in 6 to 8 min to avoid degradation of the RNA sample (Melgar-Rojas et al., 2015). Dissecting the rat to reach the temporal bones and further dissection to reach the cochlea: The dissection scissors (Mayo scissors) are placed on the back of the neck and a median longitudinal cut is made to the skull, reaching behind the ears, sectioning the head into two parts. Subsequently, the operator, using his/her hands, using the external auditory meatus as a guide, should locate the tympanic bulla with his/her thumbs and, through an outwards movement, separate it from the other structures, with a gentle twisting motion, to loosen and release the tissue (Figure 1) (Albuquerque et al., 2009). Figure 1. Tympanic bulla. 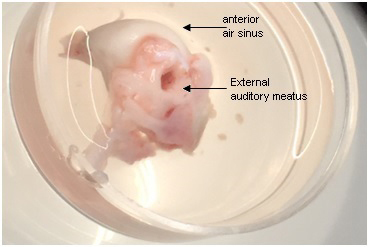 The top arrow shows the anterior air sinus and the bottom arrow shows the external auditory meatus, which is used as an anatomical landmark for dissection. The bulla is opened by holding down with one hand and placing the scissors (Wagner scissors) in the external auditory meatus, cutting in the direction of the anterior air sinus, in a single movement (Figure 2). After sectioning, the bony portion of the bulla is raised, exposing the cochlea (Figure 3). Figure 2. Opened tympanic bulla. The bulla is opened with a scissors, using the anterior sinus (top arrow) and external auditory meatus-Eam (bottom arrow) as landmarks. Figure 3. The cochlea is exposed. After opening the bulla, the anatomic structures can be observed: (R.w.) Round window, (o.w.) oval window, (s.a.) stapedial artery. 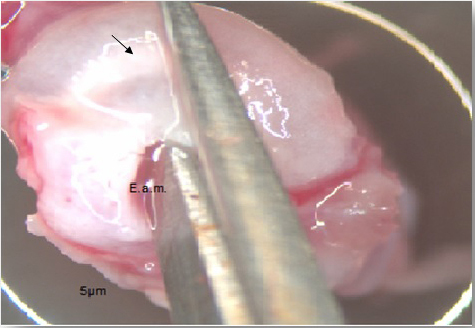 The bone is then removed placing the forceps in the round window, exposing the membranous cochlea (Figure 4). 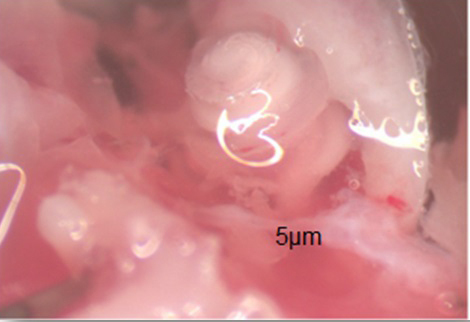 Subsequently, the membranous cochlea is removed and immediately placed in a tube containing 1 ml (1,000 µl) of cold TRIzol®. This amount of cold TRIzol® allows up to 12 cochleae per experiment. When all cochleae are placed in cold TRIzol®, they are homogenized with a Rotor-stator at 5,000 x g for 90 sec or until the tissue is totally homogenized. The Rotor-stator homogenizer allows simultaneous lysis and homogenization of tissue samples by the shearing force of a fast rotating probe. Figure 4. The membranous cochlea. 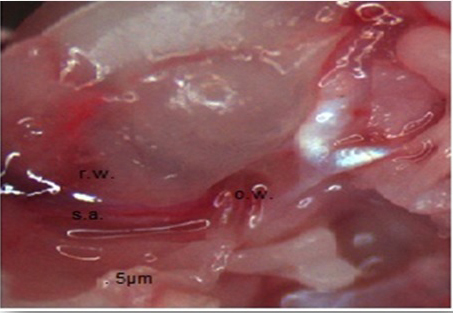 The bone is removed and the membranous cochlea is put into a tube with TRIzol®. The lysate is then incubated in Trizol for 5 min at room temperature, to allow for complete dissociation of nucleoprotein complexes. 200 µl of chloroform are added per 1,000 µl of TRIzol®. The tubes are shaken vigorously, manually, for 15 sec and incubated at room temperature for 3 min. This time point is very important for purity. The samples are then centrifuged at 12,000 x g for 15 min at 4 °C, to separate the samples into a lower, red phenol-chloroform phase, an interphase, and a colorless upper aqueous phase, which contains the RNA. The volume of the aqueous upper phase is of ~600 μl. About 400-600 μl of the colorless, upper phase containing the RNA is transferred to a fresh RNase-free tube. An equal volume of 70% ethanol is then added, obtaining a final ethanol concentration of 35%. The tube is vortexed and then inverted to disperse any visible precipitate that may form after adding the ethanol. About ~700 μl of sample is then transferred to a PureLink® RNA Mini Kitspin cartridge. The protocol is performed according to manufacturer’s instructions (www.lifetechnologies.com). To provide rapid and efficient DNA removal from the RNA, an RNase-free DNase set for On-column Pure Link® is used (see Materials and Reagents). It is possible to add 30-100 μl of RNase-free water to the center of the spin cartridge. Usually, 35-50 μl are added (due to the low amount of RNA) and the samples are then incubated at room temperature for 1 min. The RNA concentration is then measured using 1 µl of the sample loaded onto a NanoDrop. Proceed directly to cDNA synthesis or store the purified RNA at -80 °C (keep sample on ice for quantification). This protocol allows the recovery of about 47.3 to 120.04 ng/µl in RNase free water (70 to 35 µl, respectively), free of DNA and presenting limited contamination, suitable for real-time qRT-PCR analyses (Table1). 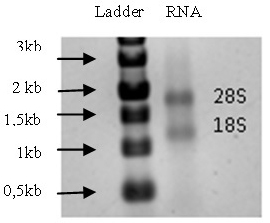 The integrity and the size of distribution of the purified RNA are verified by agarose gel electrophoresis (Figure 5), demonstrating that this kit is efficient for RNA extraction with a high level of purity (1% agarose gel (100 V/20 min)) and stained with 0.5 μg/ml ethidium bromide for band visualization–see Recipes. Figure 5. Agarose gel electrophoresis. MillenniumTM markers and total RNA samples were run on a 1% denaturing agarose gel and stained with ethidium bromide. The first column represents the standards and the second column represents the extracted RNA, with the ideal RNA molecular weight standard (28S and 18S).1. This protocol allows the recovery of about 47.3 to 120.04 ng/µl in RNase free water (70 to 35 µl, respectively), free of DNA and presenting limited contamination, suitable for real-time qRT-PCR analyses (Table1). RNA quality is verified using a NanoDropTM 2000/2000c spectrophotometer. Table 1 summarizes the A260/A280 and A260/A230 ratios obtained in representative experiments. A very common problem is the presence of RNases during RNA extraction. Thus, all dissections must be performed on RNAlater®, to reduce RNA degradation and increase RNA quality, and all material should have been previously cleared with RNaseZap® (Melgar-Rojas et al., 2015; Vikhe Patil et al., 2015). The procedure time is also important because RNA is an easily degradable material, so only extraction of one animal is carried out at a time. Several commercial Kits have been used for the extraction of ribonucleic acids from the mammalian cochlea (Hertzano and Elkon, 2012). Pure Link® RNA Mini Kit and Pure Link® DNase for on-column show good results in obtaining good quality RNA (Table 1). It is important to use Trizol before the RNA Mini kit, to perform transcriptome studies in adult cochleae (Vikhe Patil et al., 2015). The most common method used to assess the integrity of total RNA is to run an aliquot of the RNA sample on a denaturing agarose stained with ethidium bromide (EtBr). This is applied to verify the integrity and quality of the RNA for qRT-PCR after extraction. Agarose gel electrophoresis: Use 6 μl of RNA for this gel. The 28S rRNA band should be approximately twice as intense as the 18S rRNA band. This 2:1 ratio (28S:18S) is a good indication that the RNA is completely intact (Figure 5). According to the literature, purity ratios and spectral profiles are important sample quality indicators, but the best DNA or RNA quality indicator is the functionality in the downstream application of interest. It is important to note that there are occasions when the purity ratios are within expected limits, yet there is a problem with the sample (Wilfinger et al., 1997). Note: Caution HOT! Be careful stirring; eruptive boiling can occur. Supported by FAPESP-São Paulo Research Foundation. This protocol is adapted from Thermo Fisher Scientific Inc. There are no conflicts of interest or competing interest. Albuquerque, A. A., Rossato, M., Oliveira, J. A. and Hyppolito, M. A. (2009). Understanding the anatomy of ears from guinea pigs and rats and its use in basic otologic research. Braz J Otorhinolaryngol 75(1): 43-49. Hertzano, R. and Elkon, R. (2012). High throughput gene expression analysis of the inner ear. Hear Res 288(1-2): 77-88. Melgar-Rojas, P., Alvarado, J. C., Fuentes-Santamaría, V., Gabaldón-Ull, M. C. and Juiz, J. M. (2015). Validation of reference genes for RT-qPCR analysis in noise-induced hearing loss: A study in Wistar rat. PLoS One 10(9): e0138027. VikhePatil, K., Canlon, B. and Cederroth, C. R. (2015). High quality RNA extraction of the mammalian cochlea for qRT-PCR and transcriptome analyses. Hear Res 325: 42-48. Wilfinger, W. W., Mackey, K. and Chomczynski, P. (1997). Effect of pH and ionic strength on the spectrophotometric assessment of nucleic acid purity. Biotechniques 22(3): 474-476, 478-481. How to cite: Rodrigues, J. C. and Brito Neto, R. V. (2017). RNA Extraction from Wistar Rat Cochlea for qRT-PCR. Bio-protocol Bio101: e2621. DOI: 10.21769/BioProtoc.2621.